With so many things to do, it might not be very easy to decide what places to visit in Delhi. This is why we came up with a handy guide to make your Delhi trip planning smooth and pleasant. Often India travellers head directly to other regions such as Rajasthan, Uttarakhand and Kerala, and cities such as Rishikesh, Varanasi, and Kolkata (formerly Calcutta), neglecting the capital and all the great things to do in Delhi. If you do decide to stay here for a couple of days, here is our guide to help you with the best places to visit in Delhi, as well as tips on how to get there and where to eat in Delhi and where to go shopping. Check out our tips on what to do in Delhi to enjoy the Indian capital and make the most of your stay. Between the many historical places in Delhi and tourist spots, here you can have a great Indian holiday. We suggest where to start your Delhi sightseeing as well as where to stop for lunch, where to shop for pashminas and typical Indian colourful objects. We listed the tourist places in Delhi and also the less touristy ones. On top of this, we also found some nice picnic spots in Delhi where you can join locals in their relax and leisure time. You are in India, the land of fresh, juicy and sweet fruits, so as soon as you get out of your room, kick off your day by enjoying some fresh pineapple, coconut water, and mango that you can buy from pretty much any street vendor for affordable prices. After getting your full intake of vitamins, treat yourself to a scrumptious breakfast in Westernised Khan Market. How to get to Khan Market: Khan Market metro station, purple line. Whenever you are ready for sightseeing, head to the inevitable place for anyone travelling to Delhi for the first time, imposing war memorial India Gate. Beautiful at sunrise, India Gate can be visited any time of the day thanks to the huge park all around it. It’s a perfect place to visit in Delhi to chill out in the shade of the many trees, to have a picnic or just to relax before getting to your next place. If you happen on August 15th, India’s Independence Day, you can attend the celebrations in the city centre with festivals, music and handicraft and food markets all the way along the street in front of India Gate. Open all day, free entrance. How to get to India Gate: Central Secretariat metro station, yellow and purple lines. Take the metro and for lunch enjoy a nice Indian meal in one of the many restaurants the city offers. If you want to get fancy and taste Punjabi food, head to the stylish Punjabi By Nature, in a nice area packed with stores of the major brands and for every budget known as Janpath Market. Also, nearby is the big underground Palika Bazaar for clothes, accessories, and electronics. Address and how to get there: Punjabi By Nature, F-30 B, Inner Circle, Connaught Place, New Delhi-100001. Tel. 011 47675701, 011 47675702. Transport: metro station Rajiv Chowk on lines yellow and turquoise. For the afternoon, head to trendy Hauz Khas Village where you can chill out in one of the many coffee shops and tea houses. Hauz Khas is an old historical complex built in the 14th century during the rule of Muslim shahs Alauddin Khalji and Firuz Shah Tughlaq, whose mausoleum is part of the historical area, along with a small mosque and a madrasa, school for religious studies. Favourite place for Delhiites and tourists, in Hauz Khas you will find boutique clothing and jewellery shops, Indian handicraft, spas, bars, restaurants, and nightclubs if you want to linger until late. Right next to the entrance of Hauz Khas is the beautiful Green Park, city park with a nice lake, a bit of wildlife such as squirrels, monkeys and deer, and where you can even join locals doing jogging and running. In the evening, locals chill out on the grass, have a picnic, play volleyball or just take a stroll in the quiet nature for a break from Delhi’s noise and traffic. Definitely one of the top places to see in Delhi. Address: Hauz Khas Village, South Delhi. How to get there to Hauz Khas and Green Park: Green Park metro station on the yellow line. Opening hours: 10.30 am-7 pm, although some restaurants and pubs inside will stay open until 11 pm. Sundays closed. Entrance fee for Hauz Khas: Free. Opening hours for Green Park: Daily 5 am-8 pm in summer, 5.30 am-7 pm in winter. For the evening, we suggest you head again to Khan Market, a cosy area with boutique stores a supermarket and a great choice of good and different restaurants. For dinner try Parsi food at SodaBottleOpenerWala, delicious Iranian/Indian food at affordable prices. Address: SodaBottleOpenerWala, 73B, Khan Market, Rabindra Nagar, New Delhi, Delhi 110003. How to get to Khan Market: Khan Market metro station on the purple line. On the second day, if you feel like having a more international breakfast, head to Nehru Place where you will find eateries of different nationalities such as Persian and Chinese that serve all meals from breakfast to dinner. Just coming out of Nehru Place metro station you will also find Chaayos cosy tea place with a great choice of classic and speciality teas that also sells delicious cakes, sandwiches, fruit and chocolates shakes and iced teas, while crossing the road towards the electronics shopping malls there is a branch of Costa Coffee with a wide range of coffees, iced coffees, espresso, cappuccino and English cakes like brownies and muffins. Address and how to get there: Chaayos, Upper Ground Floor, Epicuria, Nehru Place Metro Station, Nehru Place, New Delhi 110019; phone +91 18001202424. Open 9 am-7 pm. Costa Coffee, G-2, Rose Building, Nehru Place, New Delhi – 110 019; phone +91 (0)11 4170 6720. Transport: Nehru Place metro station on the purple line. With a 15-minute walk from Nehru Place, you will get to a lovely temple that should be in the list of places to visit in Delhi for the first time, the Lotus Temple or Baha’i House of Worship. A huge lotus-shaped white building, the temple was inaugurated in 1986 and is meant to represent unity among all religions. The choice of the lotus wasn’t by chance as it’s the sacred flower for Indians. Set in the middle of a peaceful green park, the entrance is well organized by the staff and managed in both English and Hindu. Inside taking photos is prohibited and visitors are asked to maintain silence as it’s mainly a place for prayer. Once everyone in the line is inside, members of the staff will read a passage from different holy books such as the Bible, the Quran, and Hindu and Buddhist sacred texts. If you are still wondering what to see in Delhi, this is a one-of-a-kind landmark. 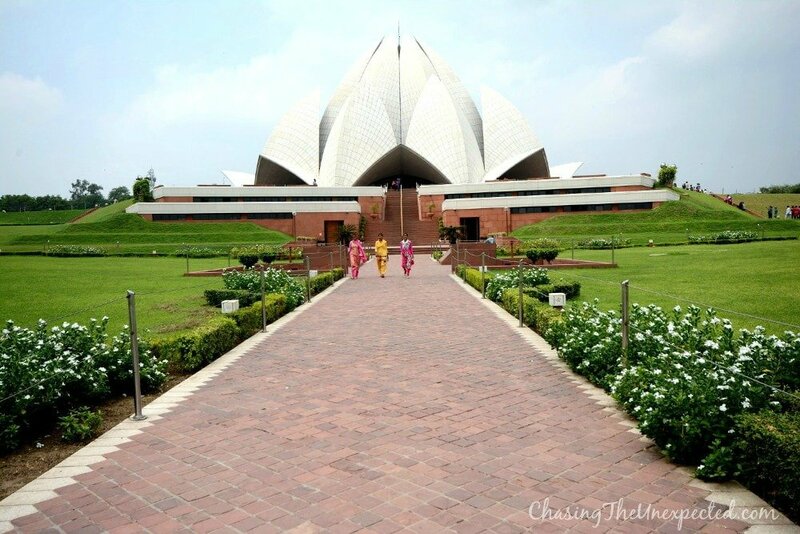 Address of Lotus Temple: Baha’i House of Worship, Bahapur, Kalkaji, New Delhi – 110019. Phone: +91 26470526/26444029. 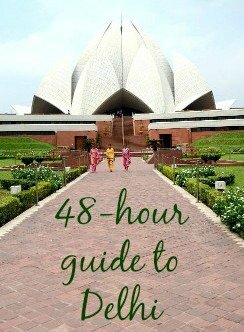 How to get to Lotus Temple: 15 minutes walk from Nehru Place metro station or 5 minutes walk from Kalkaji Mandir metro station. Opening hours of Lotus Temple: Winter (October 1st-March 31st) open 9 am-5:15 pm, Summer (April 1st-September 30th) open 9 am-6:45 pm. Monday closed. Entrance fee to Lotus Temple: Free. Dating back to 1565, UNESCO-listed Humayun’s Tomb is one of our favourite historical places in Delhi. The location, not in the immediate city centre, makes it one of the few quiet sites to visit, and in a hectic city like Delhi, it can be pretty soothing and I recommend you to add it to your list of places to visit in Delhi. Known as the first garden-tomb of the Indian subcontinent, Humayun’s Tomb shows fine Persian and Indian architectural styles and decorations symbolizing the Islamic paradise and reproducing the typical Persian garden with the water as its main element. Alongside the main mausoleum, the complex consists of other tombs from the same 16th century such as Nila Gumbad, Isa Khan, Bu Halima, Afsarwala, Barber’s Tomb and the area devoted to the craftsmen employed for the construction of the complex, the Arab Serai. Whether you are a history buff or not, this is one of the best places to go in Delhi. Humayun’s Tomb address: Humayun’s Tomb, Mathura Road, Nizamuddin, Opp. Dargah, New Delhi, Delhi 110013. Humayun’s Tomb opening hours: roughly from sunrise to sunset. Humayun’s Tomb entrance fee: 500 rupees foreign nationals, 30 rupees for Indians. Transport: Get off at Jangpura metro station on purple line and take a rickshaw for a short ride. 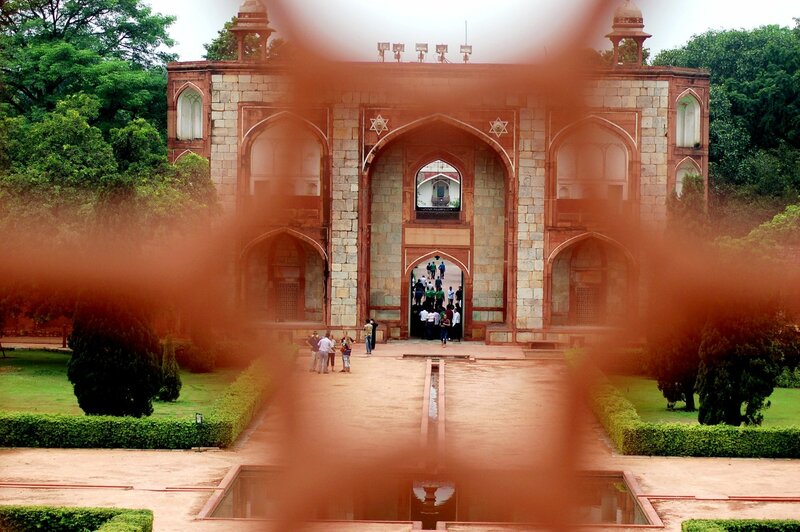 From Humayun’s Tomb, take a rickshaw to Defense Colony Market for lunch. Here you will have a wealthy choice of vegetarian south Indian food with a huge selection of dosas, north Indian with delicious dishes such as palak paneer, malai kofta or paneer tikka masala, and even Chinese, Japanese and Thai food at affordable prices. 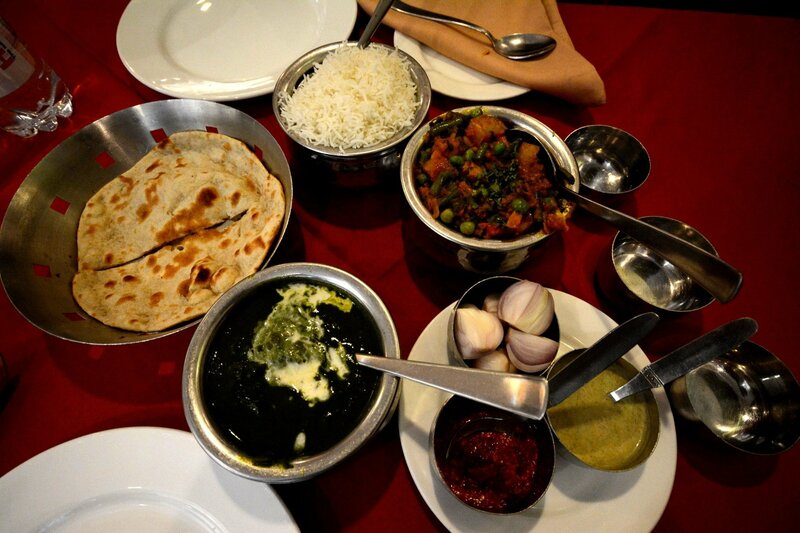 These restaurants serve mostly locals so you can rest assured it’s proper Indian food, good quality, and good prices. Defense Colony address and how to get there: To get to Defence Colony Market get off at metro station Lajpat Nagar on purple line, then take a 10-minute walk or a short rickshaw ride. Sagar Ratna for South Indian food, Defence Colony Market, 18 Defence Colony Market, Defence Colony, New Delhi. Phone +91 (0)11 24333658. Sagar Ratna for North Indian and Chinese Food, 24 Defence Colony Market, Defence Colony, New Delhi. Phone +91 (0)11 24333688/11 24333815. Aka Saka is a Chinese and Japanese restaurant, 28 Defence Colony Market, Defence Colony, New Delhi. Phone +91 (0)11 24333821/11 24333163. Among the best things to do in Delhi is definitely a day out exploring the historic Old Delhi at Jama Masjid mosque and the Red Fort (Lal Quila). The largest in India, Jama Masjid is a 17th-century mosque from Mughal Empire’s Shah Jahan, the same whose name is linked to other architectural wonders such as Agra’s Taj Mahal and Delhi’s Red Fort. The courtyard of the mosque has a capacity of 25,000 people and boasts three gates, four towers, and two impressive 4-meter-high minarets. UNESCO-listed Red Fort, not far from the mosque, is the other Mughal-era building around which Shah Jahan built the new capital of his empire, Shahjahanabad, moving it from Agra to what today is commonly known as Old Delhi in 1639. Unlike most parts of Delhi and India, this area is not very vegetarian-friendly, but if you are a meat-eater, here there is a good choice of chicken-based spicy dishes in what are mostly Muslim restaurants. After the historical places, have a good walk around the nearby open markets Chowri Bazaar, Spice Bazaar and Chandni Chowk. Extremely busy, crowded and with mental traffic all day around, here you can find pretty much everything you are looking for, be it for shopping or photography subjects. Old buildings and shops, ramshackle eateries and a myriad of rickshaws (tuk-tuk), here you can bargain a lot and if you are brave and with a strong stomach try also some of the street food that is plentiful everywhere. If you are still planning what to visit in Delhi, make sure you don’t miss the old city. Address and how to get there: Jama Masjid: Chandni Chowk, Off Netaji Subhash Marg, west of Red Fort. Free entry, but if you want to take photos or video there is a fee of 300 rupees. Open daily 7am-noon and 2-6.30pm timings. Transport: metro station Chowri Bazaar on yellow line then a short walk or rickshaw ride. Red Fort: Netaji Subhash Marg, Chandni Chowk, New Delhi, Delhi 110006. Entrance fee 150 rupees plus a fee of 50 rupees for camera and video. Open daily except Monday 9.30am-4.30pm. Transport: metro station Chowri Bazaar or Chandni Chowk on the yellow line, then a short rickshaw ride. Shopping lovers can’t miss it. If you are on the lookout for some handicraft from the subcontinent, this is definitely one of the places you should include in your sightseeing in Delhi. Here you will find textiles, bags, paintings, decorations of all types and also many small restaurants. It’s a closed area and entrance fee is 60 rupees. If you are still wondering what to do in Delhi, head to Swaminarayan Akshardham complex, entirely devoted to Hindu spirituality and Indian culture. It attracts thousands of visitors every day, some foreigners but especially locals. Inside this temple you can’t take anything, no phones, no cameras, so you will have to leave all your belongings in their locker room. I haven’t entered in the complex because it was too crowded but it sounds pretty amazing as the complex features also a water show, documentaries, a thematic garden and three exhibitions. I recommend the Garden of Five Senses among the places to visit in Delhi for some relax in nature. My husband visited it, I didn’t manage and would have loved to see it. Park with interactive activities, different garden styles, rock sculptures, hundreds of varieties of plants and different paths and nature walks to follow, this is a soothing green and silent break from the hectic Delhi city life. Like the rest of India, also the capital boasts a long past. 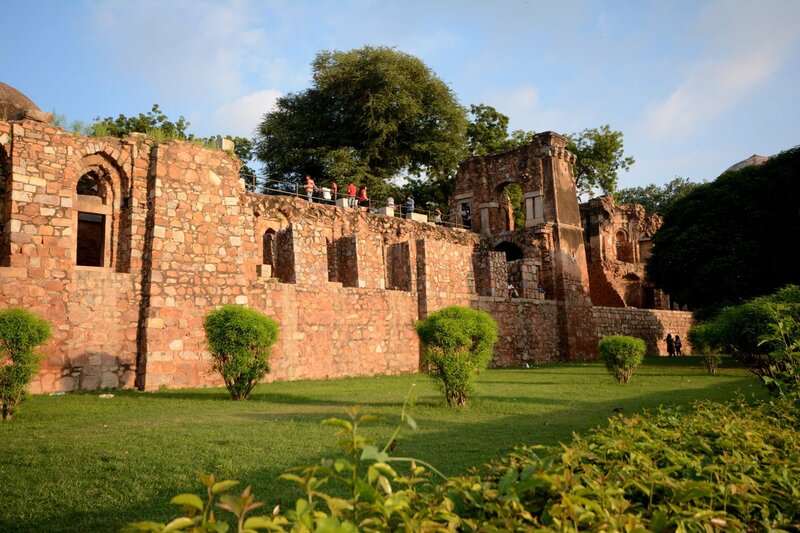 If you manage, add a few more historical landmarks in Delhi, such as Qutub Minar (also spelt Qutb Minar or Qutab Minar) and British-era Lodi Gardens, a park that hosts ancient tombs, gardens, and a lake, to the list of places to visit in Delhi. To get around in Delhi you can always use the rickshaws you will find everywhere, but they will rip you off, so make sure you bargain, which is quite of a headache. However, there is Delhi metro that reaches out pretty much everywhere, shortening a lot your rickshaw rides. The benefits of using the Delhi Metro are several: travelling becomes much cheaper, faster, safer and with air condition which, with the Indian heat, it certainly is a relief. Instead of buying a ticket each time, if you are in Delhi for a longer period, buy Delhi metro card, which costs 150 rupees, of which 50 are for the deposit and 100 already for the traffic. Each trip can cost between 10 and 15 rupees, depending on the distance, and you get charged directly from your metro card swiping when you enter and exit. You can also try the public buses. If it’s too hot, prefer the red ones as they have air conditioning and, since a little more expensive than their green and orange counterpart, they are also less crowded. They usually go pretty fast except during rush hour as they can easily get stuck in traffic. On buses, you need to tell the ticket assistant the station you are getting off and you will pay cash, so make sure you have some small change. Delhi is usually pretty warm, even during the raining season, which means it can rain for about an hour per day and not even every day, the weather is hot and humid. During this season you may want to use proper mosquito repellent as there is a chance to catch Dengue fever, which can ruin your trip as you will need proper medical treatment. When it comes to clothes, obviously choose light summer clothes and comfortable shoes, either runners or open shoes. India has a conservative culture, and Indians are pretty well-known for their “staring culture”, so if women don’t feel very at ease they can wear some loose longer tunic. If you are here for long enough and you want to buy Indian clothes, you will find good prices in Rajiv Chowk shopping street. As the sun is always pretty strong, don’t forget a good cream with SPF. Especially when it comes to street food or the little eateries around the bazaars in Old Delhi, hygienic conditions are not optimal, so if you are brave enough to try them, be also wise enough to have some medicines for food poisoning or stomach problems, or at least activated charcoal and probiotic supplements (a toilet paper roll won’t harm either!). Try to pick boiled or cooked food and preferably from busy stalls as they are more likely to sell freshly made food rather than some pieces that stood there for a long time. Strictly stick to bottled water and avoid ice since it can be made from tap water. , a small device that uses UV light to make viruses harmless and clean the water in as little as 48 seconds. It would also save you from carrying many bottles if you go hiking in the wild. We have written an extensive article on how to avoid getting sick in India, check it out if you are going to stay for the first time. Whether you have a sensitive stomach or not, if you are travelling to India, make sure you have travel insurance that covers also medical expenses and a return flight in case you get sick and prefer to get home. World Nomads has great coverage that you can buy, extend and claim when you are at home or if you have already left and are travelling. If you want to buy a brand new SIM card, do it only if you are staying for a longer period as it will take at least 8 hours to activate. In case, shops also have already activated SIM cards, so you might prefer those even if a little more expensive. When you buy a SIM card, a copy of your passport is needed. If you are travelling to different states, usually a roaming charge will apply, so ask the phone shop about it when you buy the card. I wholeheartedly recommend you buy a VPN. It’s super important not only to access websites filtered by local governments but also, and more importantly, to prevent online theft that is becoming so common. When we travel, we want to stay in touch with the rest of the world and we connect to whatever WiFi we find, often not secure. A VPN saves your transactions and keeps your online browsing safe. Click here for details and prices on the VPN I use. Pay attention to your personal belongings such as phone and money as pickpocketing is quite common especially in crowded and touristy areas. Don’t show off a large amount of money and have it spread out in different pockets, preferably with zip or even a fanny pack. You can also wear some safety clothes and carry pickpocket proof travel gear to feel safer and less worried especially in busy areas. Click here for more details on products and current prices. In markets, you can haggle the price, as for tourists they usually charge some ridiculous amounts, but if the bargaining starts to become unpleasant or turn into a scam, it’s better to just walk away. If you want to buy large and expensive goods, prefer government-run shops to avoid scams and receiving the wrong items shipped home. Rickshaw drivers will also charge you more than locals, hard to know what’s the right fee as it depends on the ride. 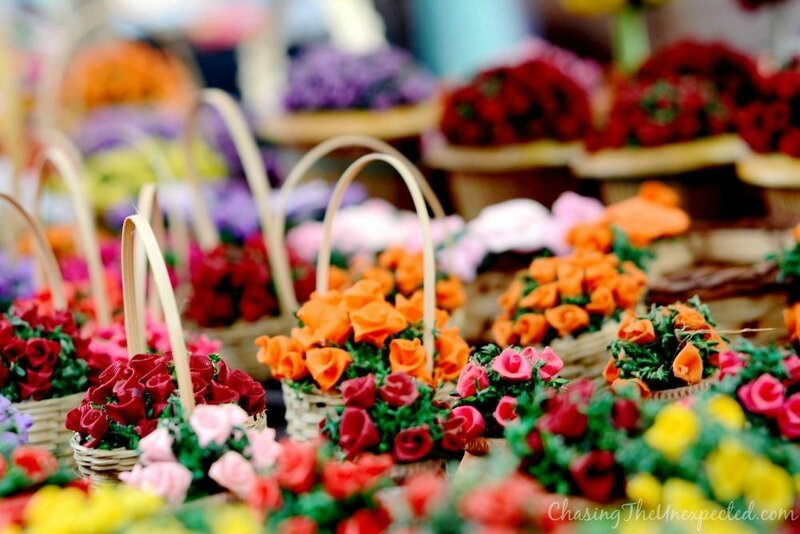 However, often they will offer you to take you to “shopping malls”, which are usually particular shops along busy shopping streets where they get a commission. ⇒ For more tips on how to avoid pickpockets while travelling, click here. 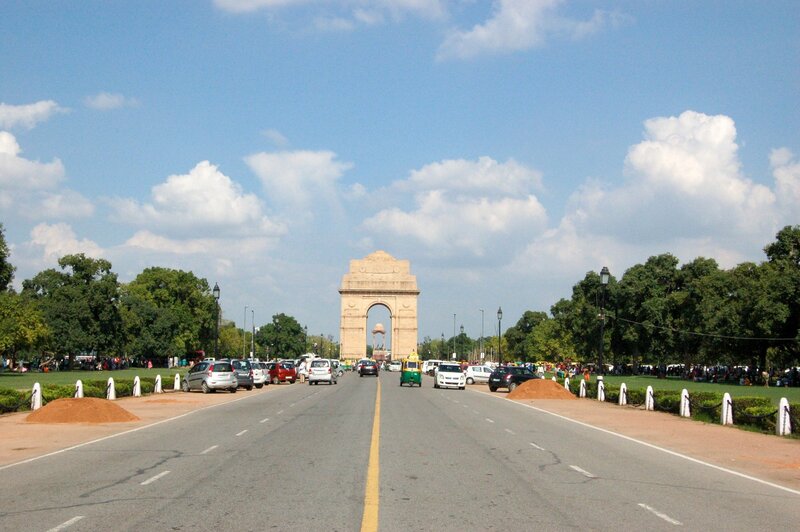 Delhi offers a huge and diverse range of accommodations, from luxury five-star resorts to great budget hotels. This is a small list of some of the favourite accommodations in New Delhi. For a full guide to the top hotels in Delhi, check out our detailed post. Finally, subscribe to our newsletter to get your free PDF copy of our 48-hour Delhi sightseeing guide. Alongside tourist and historical places in Delhi, our guide features the restaurants we liked during our stay, the places where we wandered and chilled out, nice shopping streets and ways to enjoy the best that Delhi has to offer. I’ve seen a lot of Temple across the globe but Lotus Temple is quite unique from the outside. I hope a lot of tourists will find this place fascinating, cos I really do. Thanks for the tour. Nice work… I really appreciate your hard work to complete this nice post about Places to visit in Delhi. 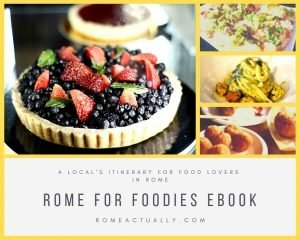 Thank you Sonali, although It did take us a lot of time to write this guide but with the feedback I have been receiving I can for sure say it was very much worth it. We are glad our readers like it. What a great way to learn about India. Thanks for sharing your experience.